It's really hard to write a review of a game that I have genuinely been looking forward to, in a franchise that means quite a lot to me. 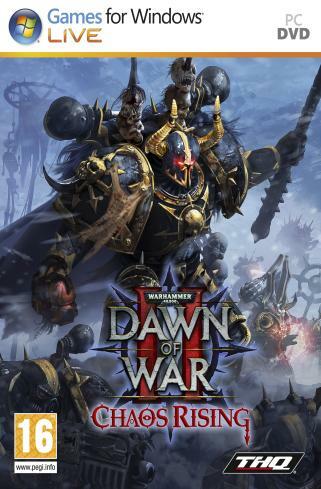 The first Dawn of War game started me down my path into Warhammer 40,000. I've played all the games except Soulstorm (only because it came out with little fanfare, and I was on a budget with Dawn of War II coming, and figures to buy). I'm an Ork player, and a Xenos lover, so while I may not be as obsessive about the Blood Ravens as some people I know (*cough* my buddy Steve *cough*), I have enjoyed the overall story throughout the Dawn of War series. 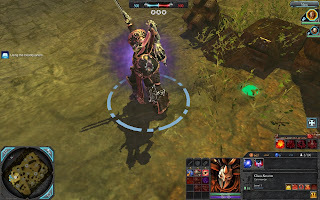 Dawn of War II also added RPG elements to the single player game with each unit symbolized by their commander whom you could equip with armor, weapons, and miscellaneous wargear drops that gave them certain abilities and items to use. The game added to the story, progressively revealing the plot as you completed missions on the three planets of Sub-Sector Aurelia. The story progressed as you progressed. You gained certain abilities, items, and experience depending on how you played each mission, how you equipped your units, and also which missions to take (some were optional, some had a time-limit to take them - either taking the mission or not affected the story and other missions on that planet). Chaos Rising is about a war, but it's a far more personal war. Having taken my Blood Ravens all the way to level 20, I imported them into the Chaos Rising campaign. They were there, like old friends, ready to strike against any who would stand against them or the Emperor. But this time, they battle not just the Xenos, but the forces of Chaos, and their own darkness. Each decision you make affects every squad in your command. Those who are on the mission, and those who await your return in space. Dissension is something I sensed as I made decisions as the Force Commander some of my Sergeants didn't like. And they told me as such. All of this adds to this feeling of foreboding the story projects nicely from the get go. There are two distinct gameplay branches you can take in the Chaos Rising campaign. But unlike the Winter Assault expansion in the first Dawn of War, this campaign is not so straight forward. And the branches are more like to interconnected webs. You can move from one to the other, but the more you move into corruption, the harder it is to get back to redemption. All of this works well, as it makes the story more personal, the decisions I make as the Force Commander have lasting repercussions, and as such I find myself weighing them more. It's less about the viability of completing the mission at hand, I have to think in a broader, bigger picture mentality. I can take the easy way to finish a mission, but I will carry the taint of corruption with me. I can take the time to find the blessed path, but do I risk letting everything I've fought for come to naught because I took too long? These are the kind of questions you face as the Force Commander in the story. Did I mention the Space Hulk? Because part of the game takes place on a Space Hulk, a nice nod to the board game. And while it's the Blood Ravens instead of the Blood Angels exploring it, the BAs can't really complain because they at least are getting their own codex. The day before Chaos Rising came out, Dawn of War II received a nice update. 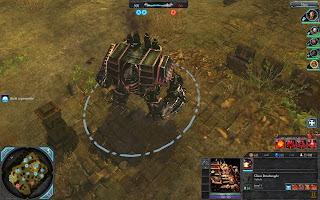 New units were released for the existing factions (they also make appearances in the campaign). These units, Eldar Wraithguard, Ork Weirdboy, Space Marine Librarian, Tyranid Genestealer Brood, and Tyranid Tyrant Guard are available to all Dawn of War II owners for multiplayer, and they appear in the Chaos Rising campaign. I mean of course the Librarian does, but so do the others as you run into those factions on the different planets, vestiges of the war from Dawn of War II still hanging on (or Genestealers on the Space Hulk, I did mention the Space Hulk, right?). In multiplayer I've only tried the Ork Wierdboy and he's a must for me now. He's unpredictable, powerful, and I love the sight of him flinging Orks towards a fight. Also a new game mode, Free for All, was release although I forgot totally about that with everything else and have yet to try it. Hard to believe, but he's just as disgusting from behind. On a side note: As a fan of one of the xenos factions, I do wish Relic would put together some campaigns for the non-Space Marine factions. As much as I enjoy the overall story arc of the Blood Ravens, something for my Orks, or any of the other factions, would be nice. Chaos Rising also came with two new heroes for The Last Stand online gameplay. The new heroes in are a Tyranid Hive Tyrant, and a Chaos Sorcerer. The Sorcerer is an excellent support unit, but is easily killed. Especially with a group of just Sorcerers as I found out in my first try with him. The Tyranid hero is more resilient, and has some wonderful abilities like Poison Cysts and Warrior Nest. I suspect, however, he'll not get the attention he deserves because of all the Chaos-y goodness (is that phrase an oxymoron or paradox?). I do continue to experience some minor technical difficulties. The game loves to mess with my soundcard settings, and I've experienced both the giving and receiving end of microphones run amok in The Last Stand. And for mine, I unplugged the mic and it still appeared to be flooding the game with noise. I had to mute the guys I was playing with who had the same problem. These are problems I experienced with Dawn of War II, so I'm used to having to go back and fix the settings before I play any other games with friends, but that doesn't make it any less annoying. All in all, the Chaos Rising expansion is worth every penny. The story telling is far more nuanced than previous offerings. The threat of corruption adds weight to every decision. And the corruption vs. redemption plotlines add to the replayability level. The series continues to improve and impress with each outing, and besides my minor gripes still had me at "For the Emperor!"